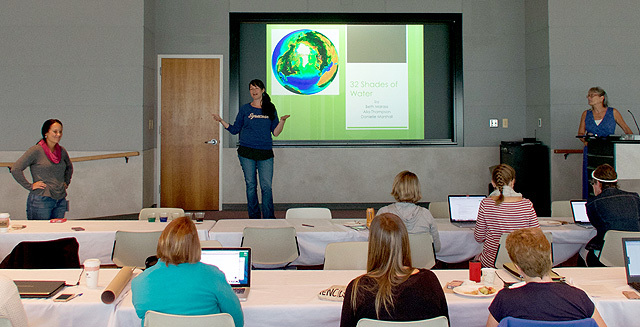 Teachers discuss a lesson plan during an EARTH workshop at MBARI. Image courtesy of George Matsumoto. A few weeks ago an excited group of teachers from around the United States gathered in a classroom in Newport, Oregon, to learn about oceanographic research using high-tech research vessels, ocean observatories, and underwater robots. Their goal: to develop lesson plans that will inspire students by bringing real marine-science data into classrooms. The June 2018 workshop was the latest chapter in a joint effort by MBARI and the Monterey Bay Aquarium called Education and Research: Testing Hypotheses (EARTH). The overarching goal of the EARTH program is to help teachers develop curricula that use real-time scientific data, aligned with modern educational standards, to help teach science in an interactive and engaging way. Led by MBARI Senior Research and Education Specialist George Matsumoto, the EARTH program has sponsored teacher-training workshops every summer for the last 15 years. Since 2003, over 220 teachers and informal educators from across the US have participated in EARTH workshops. 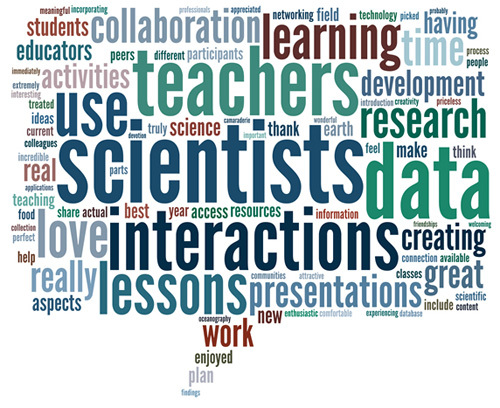 They include elementary to university-level teachers on a wide variety of subjects, as well as professionals at organizations whose mandate is to share scientific data for educational purposes. Excited by the opportunities and eager to develop additional lesson plans, many participants have attended more than one workshop. In addition to benefitting teachers and students, the EARTH workshops also give researchers a chance to connect with teachers and others who can help disseminate their research and projects to the public. John Carlson of the National Oceanic and Atmospheric Administration’s Southeast Fisheries Science Center describes his research to educators during a satellite EARTH workshop in Florida. Photo by Elizabeth Eubanks. The typical EARTH workshop involves about 20 participants, up to a half-dozen researchers, and a few facilitators. The participants spend a jam-packed week learning about ongoing research, discussing the data coming out of this research, and preparing lesson plans around these data. Post-workshop surveys show that the program has largely achieved this goal. Over 80 percent of the program participants used EARTH lessons after returning to their classrooms, and almost 75 percent used EARTH lesson plans more than once. After an initial planning workshop in 2002, the first annual EARTH teacher training workshop was held at MBARI in 2003. Since then workshops have been hosted by other research and educational organizations from Florida to Alaska. This year’s workshop was hosted by Oregon State University, the university’s National Science Foundation regional class research vessel, and the Oregon Coast STEM Hub. Participants have been so inspired by the national EARTH workshops that in 2012 they began organizing their own satellite workshops to engage local scientists and educators in exploring topics that are relevant to their communities. As in regular EARTH workshops, the participants attempt to create one or more lesson plans that integrate scientific data into the local curriculum. The hosting teacher takes responsibility for contacting and recruiting a researcher, finding an appropriate venue, and recruiting local educators to participate. 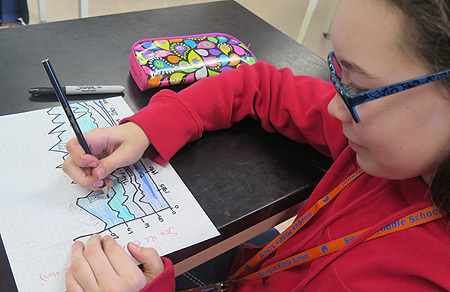 A student works on a graph of data on sea ice analyzed during an EARTH lesson assignment. Image courtesy of Jennifer Magnusson. The tangible results of the workshops–about 100 EARTH lesson plans—are freely available on MBARI’s website for use in classrooms around the world. Some of these have been edited and published, but even the lessons in development are actively being used in classrooms. The ever-growing EARTH website is the result of years of effort by educator Jennifer Magnusson, who started out as an intern at MBARI during the first EARTH workshop in 2003. Magnusson also helps promote the EARTH program through conference presentations and social media. 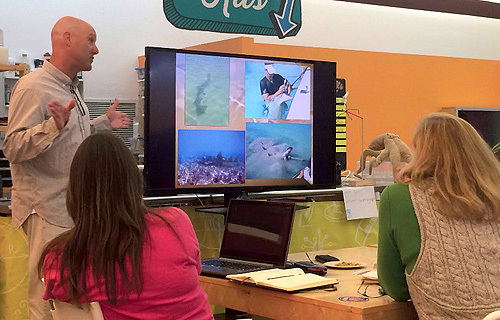 By the end of this year’s EARTH workshop, the participants had worked up a dozen new draft lesson plans covering topics from marine-mammal strandings to ocean acidification. Over the coming year these plans will be refined. Eventually they will be posted on the EARTH website for use by educators far and wide.